Ask 10 different people what they think about buying an extended warranty and you’ll probably get 10 different answers. In my opinion, they are a waste of money. I have NOT had a good experience with them and nine times out 10, would say NO if offered to purchase one. I don’t like to say never because you never know. These days you can purchase an extended warranty on just about anything. Even Walmart is asking if you want to buy one when you buy a Blu-ray or video game. I always say “No thank you”. A few years back I purchased a computer at a big box store. It’s the salesperson’s job to upsell you the warranty package when you make your purchase. At the time, it sounded like a good thing. I realized months into it that I was wrong and wished that I could go back and change my answer to a big fat NO. However, I was locked in for THREE YEARS on the dang thing and there was nothing I could do. I marked on my calendar the day it ended so that I could make sure they can stop charging me for it. I keep kicking myself for buying. I guess the moral here is to think before you opt into an extended warranty. I learned my lesson from my mistake and wished I had given careful consideration. I will be a much smarter shopper now when I purchase a new laptop and politely decline the upselling offers. In my case, there was no need for it and I wasted so much money on it. I shudder to even think about it. So why, in some cases, is an extended warranty unneccessary or even a complete waste of money? Here are seven reasons to say no. 1. Most items you purchase are already covered by a manufacturer’s warranty. If something happens to the product, you may already be covered and won’t have to shell out the extra cash. Take a computer for instance. Three years is a LONG time for a laptop. I’m surprised mine made it this long. The manufacturer’s warranty on my laptop covers one year parts and labour if something happens. When you purchase an extended warranty, be careful it doesn’t end up costing you MORE than what you paid for the item itself. 2. Read the fine print on an extended warranty. If you considering purchasing one, pay attention to the contract you are signing. What is covered and what isn’t? How much is it going to cost you in the long run? $15 a month doesn’t sound like much, but multiple it over three years and then see where you’re at! 3. Product is low value or can be replaced easily if need be. Take the Blu-rays at Walmart. You can buy them from anywhere from $4 to $30. If for some reason it broke, you could easily replace it. Save your money and spend that $1 elsewhere. 4. The extended warranty is too expensive. I wouldn’t recommend going into debt purchasing an extended warranty. Not only will you have to pay for the warranty itself, but interest on it. If you finance it on your credit card and don’t pay it off within 30 days, you will pay interest. That warranty will cost you even more money compounded over the years! Also, the warranty can end up costing you more than the item is worth. Always figure out the total cost before you sign up. 5. You’ll still have to pay for the warranty even if you aren’t using the item. Will you use the item for the term of the warranty? If so, maybe consider it. If it’s item that depreciates quickly in value, it may be best to just say no. Take my computer for instance. I would have rather saved all those monthly payments and purchased a new computer than suffer with the old beast because of this extended warranty! 6. Your credit card may also offer a warranty. For example, some cards will extend the manufacturer’s warranty for a period of time if you purchase the item with your credit card. Check your cardholder agreement to see what yours offers. Mine offers up to one year extension on the manufacturer’s warranty. 7. The cost to repair or replace the item is low. I’m going to take my chances next time around. The item may never break or need any replacement parts. If it does, I’ll deal with it when the time comes. Better yet, I’ll invest the money I was wasting on paying for an extended warranty and line my pockets instead of the other way around! I was curious what some of my blogging friends thought about extended warranties so I did a little crowdsourcing. The responses was mixed! Hindsight is always 20/20. If only I had known then, what I knew now. 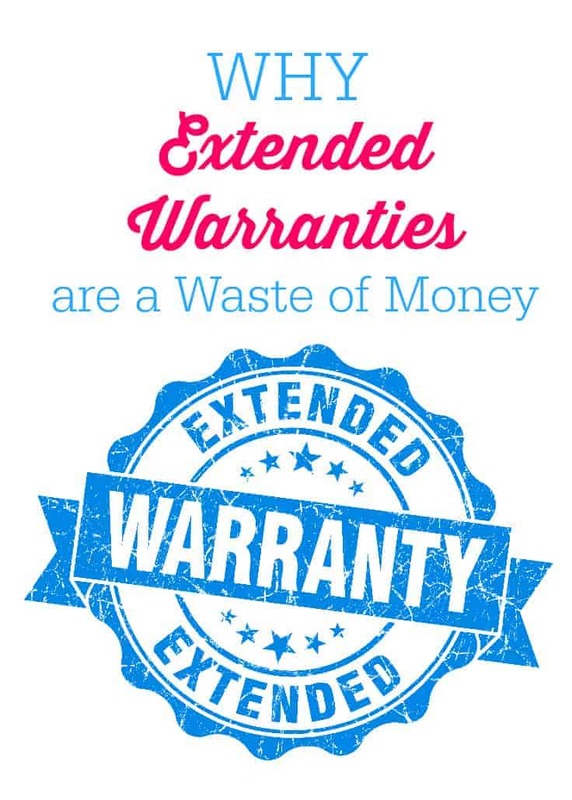 Do you think extended warranties are a good investment or a waste of money? I’d love to hear your thoughts! Good advice. I was doing research on extended warranties for cars and I feel the same way. For myself, I’m most likely going to have a different car after 3 years and credit cards do offer lots of protection for auto repairs, so I don’t feel like I need to get one. Thanks for shedding light on all warranties. I got an extended warranty on my car, and it was the last year of the warranty, and the mechanic used my extended warranty to get me free car repairs to the tune of 1,500. But the extended warranty was 1,000 dollars, so I only came out saving 500 dollars. I do not think getting extended warranties are a good idea. My appliance repair man told me to always get the extended warranty on my appliances. He said he buys it himself when he buys a new appliance. He told me the way things are built today is not like they used to be. People don’t want to pay thousands for an appliance, so they are built cheaper. He told me the price our parents paid for an appliance, in today’s dollars, would be HUGE. The other thing is that you can no longer buy just a part for an appliance, they come in modules, which of course are more expensive. Extended warranties, in my opinion and in my experience, are a waste of money. I do not purchase them unless the item is a gift, then I feel I should do so for the recipient. I enjoyed reading your take on them and the comments of other bloggers. Good topic. Totally disagree with you and have had the exact opposite experience, twice! We purchased an extended warranty on our car. Had a service appointment, less than 1000km before the extended warranty and it saved us at least $5000. Second example, our not so great dishwashers where we sadly did not get an extended warranty. A month after the standard warranty, it was leaking water. The repairs and service calls cost $500, a short time later the rack broke. When we purchased it, it was at the higher end of costs but ended up being less than stellar. We will always purchase an extended warranty from now on. I think it depends on the product and the cost of the warranty, when I got my ipad it was 9.99 for 2 years. I ended up having to use it twice. Apple has the best customer service, no BS no cost to me. They simply replaced it both times. I side with you – I think 9/10 they are not worth it either! I get extended warranties on apple products and headphones ( my kids go through them once a month so its cost effective). We had a nightmare with a fridge and after 25 visits and being accused of holding the door open. They refused to call our fridge a lemon. We cut our losses and got a new fridge. The extended warranty on new cars we dont get as if you read the fine print…. I love Costco Concierge warranty for electronics. I recently bought a new laptop and got the warranty as it covers accidental damage. With two kids there is lots of accidental damage in my house and my previous netbook was dropped and it cost us $70 to replace the screen. More than what this warranty was and thankfully my husband is an IT tech so was able to do the work himself. Two months after buying the laptop my dog “accidentally” chewed the power cord and they sent us a new one! I’ve only bought an extended warranty once and the product went on to “live” for many years so I never got to use it. However, I know others that bought the warranty and when the time came to use it, they company/store/brand didn’t honour it. I don’t buy lottery tickets so I doubt that I’ll buy a warranty again in the future. For several of the same reasons you posted, I never purchase extended warranties. I decline most extended warranties. The only one I have opted for in recent years is a 10 year extended warranty on our homes heating and air conditioning system. It was a few hundred dollars but it has already paid for itself. For some things yes it is a waste of money. I bought head phones for my kids over a year ago, paid around 25.00 on sale paid another 5 for warranty, still cheaper then paying full price, and I have replaced them at least 3 time for free. Generally I don’t buy them. I think I fall into the “just depends” category — what I’m buying and whom I’m buying for. I definetly agree with you! I kept paying each year for my front load washing machine, because I had a problem within the the regular warranty time and it cost over $500.00 to repair it. Over the extended warranty period I paid way over $500.00, so I have never done it again! I don’t believe in extended warranties either and do not purchase them!! I like how you include other bloggers thoughts, too. Great job! My husband and I are like you NO! No thanks. Yes, I’m sure it’s a bargain, but like you said often if something does go wrong it isn’t covered in the warranty anyway. Read, think, and make the educated decision for you. The only thing I’ve ever bought an extended warranty for was my big TV, that just gave me peace of mind. I have regretted not having one once on a washing machine, it was one year and two weeks old when it broke down and at the time in Europe you only had one year of warranty – in most countries it’s now 2 yrs. I was disgusted when the repair man actually had the nerve to tell me I was using it too much! I think it depends on the items. For cars, yes I do get extended warranty. For laptops and washers, we got extended warranties but when the companies folded we lost our warranties on those items.